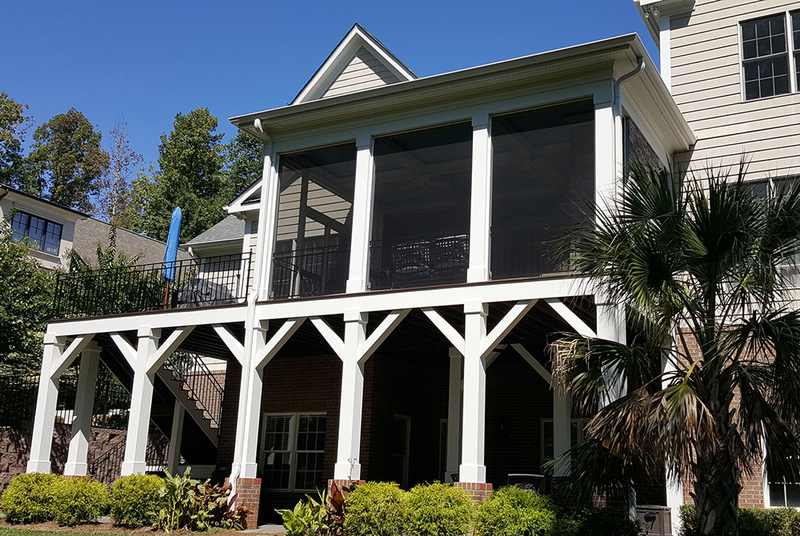 Adding a new screened porch to your home is an easy way to add value and create a space for you and your family to relax and enjoy. However, it’s not always easy to figure out what style and finishes will go best with your home. It’s very important to go with something that blends seamlessly with your existing home and does not look like an afterthought. There are many ways to accomplish this and there are plenty of pitfalls to avoid as well. The very last thing you want to do is put a lot of money into something that looks like it was stuck onto the back of your house! 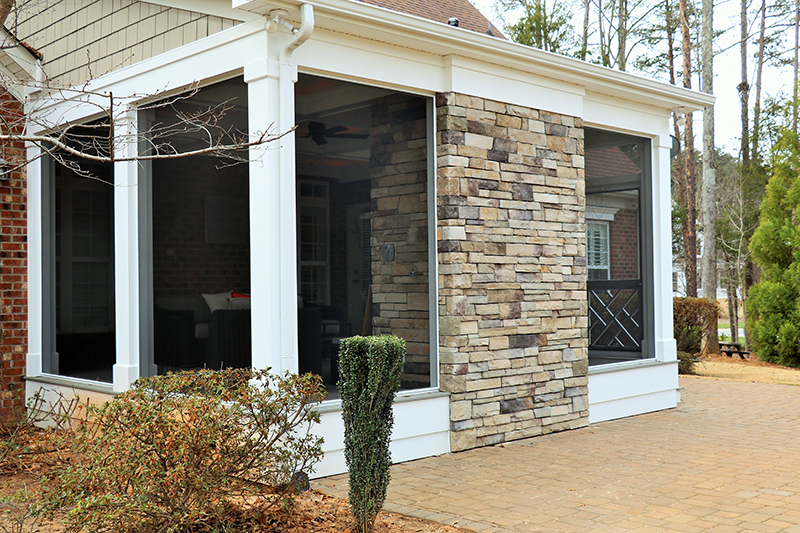 Before we dig into styles and finishes, see why hiring Fineline Construction to build your new screened porch makes a lot of sense! 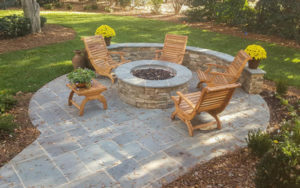 Our team of experts are professional and courteous, while providing extraordinary service with superior craftsmanship. 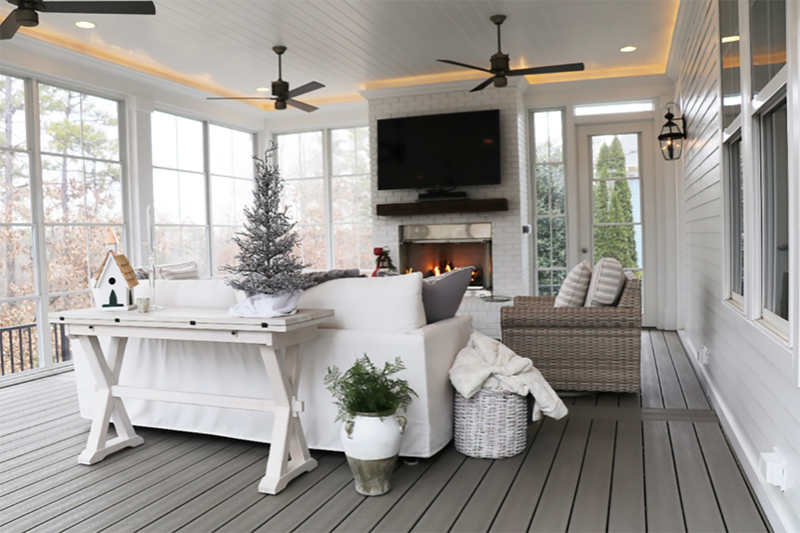 Let’s take a look at some of the styles and finishes that will help make your new screen porch something you can be proud of and enjoy for a very long time. There are many different roof styles to choose from but there are often limitations on which style you can use, depending on the style and layout of your home. Oftentimes there are windows or other rooflines that make it very cost prohibitive to have certain types of roofs. 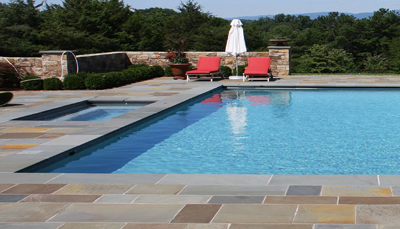 An experienced contractor can determine which style will work best for you. The flooring options available today are many so how do you know which one will work the best for you? That depends on the look you desire as well as your budget. Here are the most common flooring types with some pros and cons to help you decide which one is best for you. 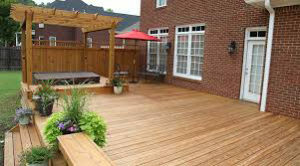 Most composite decking is made from a combination of sawdust, plastic, wood chips and resin. Premium composite decking also has a PVC outer shell that protects the composite inside. This shell adds fade protection and is mildew resistant as well. Most PVC shell capped decking only requires a simple deck rinse twice per year. Trex Select is the most budget friendly product Trex carries. This line is not as thick as the Enhanced and Transcend but is still considered a high-quality composite product. The good news is the warranty is the same as their top of the line decking. This makes it a great bang for the buck product! 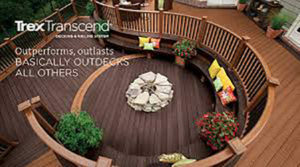 Trex Transcend is the best composite decking product available. This line comes in twelve luxury colors and has a deep wood-grain pattern making these boards look just like real wood. 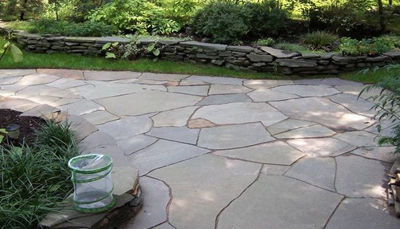 Flagstone is an awesome floor option for any outdoor project. 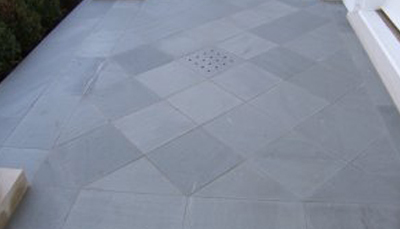 It comes in different thicknesses usually ranging from a half an inch to two inches and can be installed in a variety of patterns. When sealed, it is stain resistant and will last for many years. The biggest con for this product is that it is hard. There is zero forgiveness if you fall on it, making it not the best selection if you have young kids that will be playing on it frequently. 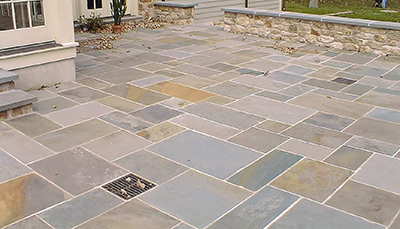 Choosing flagstone for your new screened porch will add an element of timeless beauty and elegance. Pressure treated decking is the most budget friendly flooring option available and looks really nice if installed correctly. It is very important this material is installed correctly. Oftentimes, carpenters install screws too close the end joints and this results in the boards splitting. Once they split, it will only get worse with time. Another annoying thing with pressure treated wood is that you must deal with splinters getting into your feet! Pressure treated wood also requires a lot of maintenance. In fact, if it is exposed to a good bit of sun, it will need to be stained every 1-2 years. This can get very expensive over time, so it is very important to think about the initial savings versus the long-term costs of maintaining it. If you can get past those annoyances, this wood can be a great addition to your new screened porch. It can be stained, painted or left unfinished. You can also use a large area rug to break up the wood and help give your space a warm and inviting feel. The type of products used for the exterior trim and columns have a lot to do with the style of your home as well as the vision you have for your new space. For example, if your home has painted eave trim then you may want to consider using a cement-based product such as Hardie brand soffit in combination with a composite-based fascia trim and paint to match. If painting is certain, using a composite-based trim such as Miratec is the way to go. Miratec is resistant to moisture, rot and termites. It is also reversible with a woodgrain texture on one side and a smooth surface on the other. It won’t check, split or crack and has a 50-year limited warranty as well. If, on the other hand, you desire a more rustic screen porch space, you may decide to use cedar material. 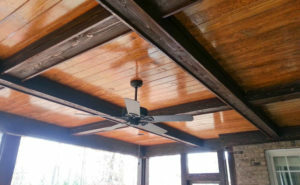 Cedar comes in rough or smooth and can be left unfinished or stained to the color of your choice. It is important to use proper fasteners when working with cedar. Stainless steel is the best choice as most other types of fasteners will leave black streaks under them over time. It is next to impossible to remove these stains and they can leave your space looking old and run down in just a few short years. There are plenty of other products available for outdoor use but these are the most common and are tried and true with warranties to back them up. We offer gable, hip, flat and custom roof styles. 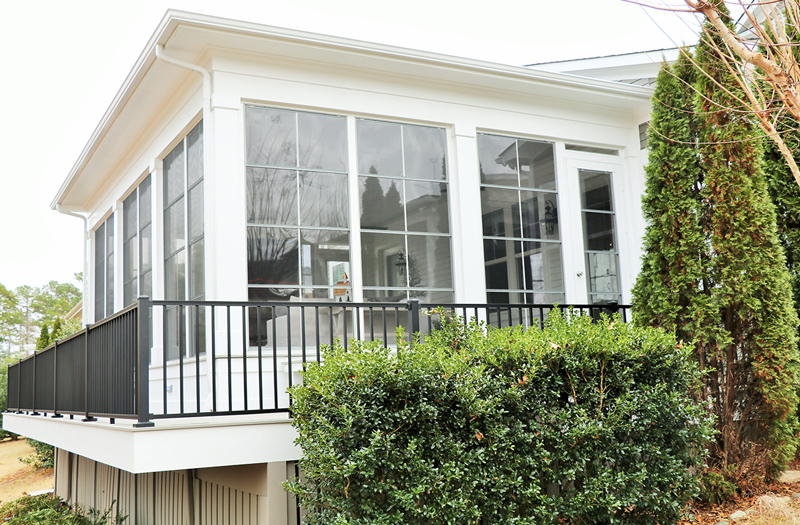 Depending on the style of your current home, we will design a beautiful screened porch that will blend in seamlessly. You can choose anything from removable screen systems to more traditional fixed screen panels. The options are truly unlimited, so please call us today at 704-332-1747. 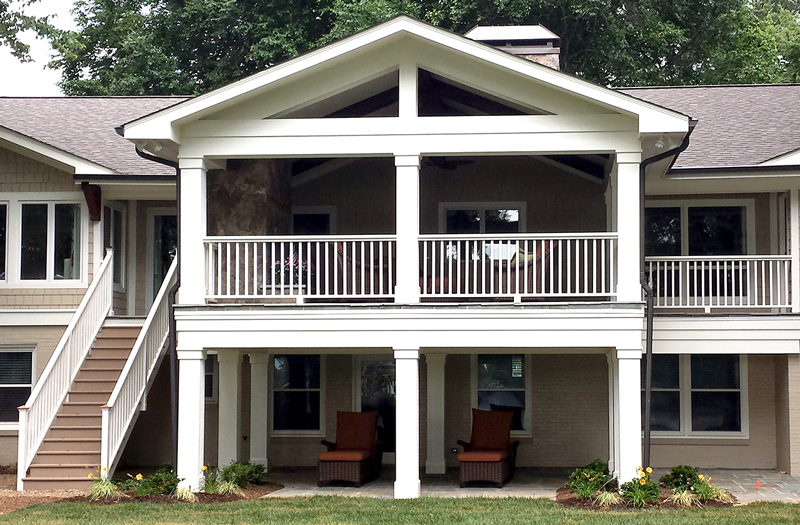 We would be happy to discuss your new screened porch project! We serve Charlotte, NC and the surrounding areas.